This weapon appears in many variations, sometimes being implemented with a guard or scabbard and was even known to be mounted as a sword. It could be carried hanging from the belt or from the wearers wrist. 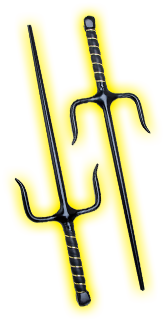 The original concept of the sai was used solely as a parrying weapon.